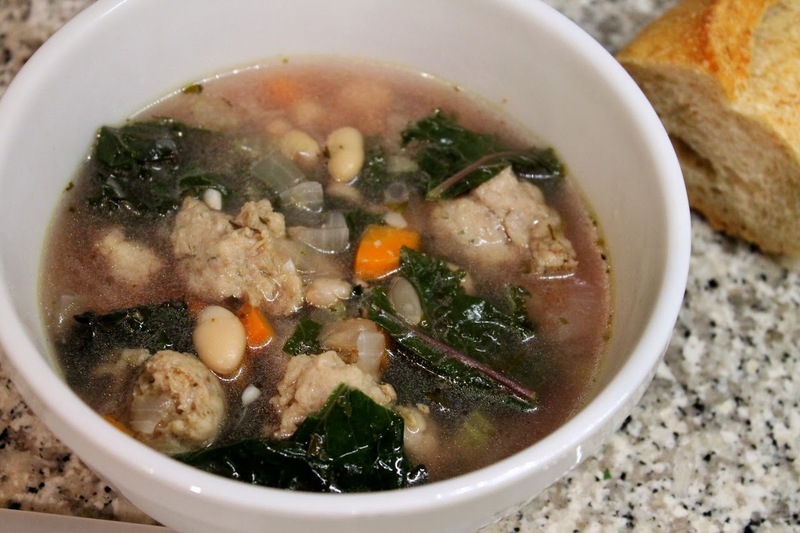 A simple soup consisting of a meat, a bean and a green works so well in winter. It comes together pretty fast too: this one takes just over a half hour to have ready. You could even speed it up a bit by using chicken or vegetable broth. I used water, so that the flavors of the ingredients made its own broth, but I also added additional simmering time for this. This kind of soup is extremely versatile. Start with mirepoix (that's the fancy French term for onion, celery and carrots, also known as sofrito in Spanish). Add a meat (or not if you want to make a vegetarian soup). Add seasonings, beans of any type and liquid. And lastly, add the greens. Since they generally cook faster, the greens go in last. I used red kale for this recipe and simmered the kale for about 15 minutes. If using a different green, you may need to adjust: collard or mustard greens would take longer, while spinach cooks much faster. I finished this soup with a little white balsamic vinegar to add a slight acid note that nicely balances the soups' savory vegetable flavors. You could also use lemon juice or apple cider vinegar. 1. Heat olive oil in a Dutch oven or large soup pot over medium heat. Add the onion, celery and carrots, season with salt and pepper, and cook until the vegetables have softened and starting to brown lightly, about 10 minutes. Add the sausage and continue cooking until the sausage has browned, breaking up it with a wooden spoon as it cooks. 2. Add the bay leaf, oregano, thyme, water and beans. Increase heat to medium high and bring to a boil. Reduce heat to medium-low and simmer for 5 to 10 minutes. 3. Add kale, increase heat to medium, and simmer another 15 minutes. Remove from heat. Stir in the white balsamic vinegar. Serve in bowls topped with grated parmesan. This was great! White beans are always a welcome addition to soups.